A collaboration between The Lonely Londoners and New Slang Productions. 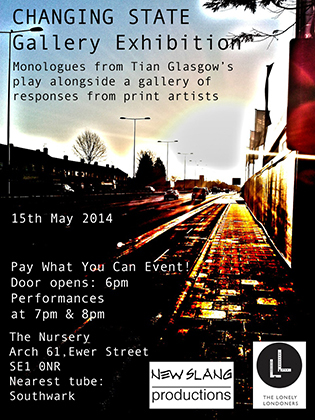 Bringing together monologues from Tian Glasgow's play CHANGING STATE in a gallery of artist responses to the emotions and themes. CHANGING STATE is the second play written by Tian Glasgow. It is a darkly comic coming-of-age tale based around four inner city young adults as they make important decisions about their future. Get a taster of the show and view the work of a group of artists who connected with the script. This is a gallery event so come to view the art as you wish. All additional money will go towards funding the research and development of the full play.